Are you considering creating a Facebook Page for your business but are not sure where to start? Do you currently have a Facebook Page but are not seeing the engagement that you want? This section will dive into some of the basics when it comes to creating and managing a Facebook Page. Choose a page type and category. You can always change this later. Add a profile picture. Ideally this should be your company logo or the CEO/Founder. Add your company information, making sure to include a link to your website. Add more detailed info about your company under the About tab. To add additional administrators to your page click “Settings” (on the far right), “Page Role” (on the left hand side). You can add new admins by either entering their name or sending an email to the email address associated with their personal Facebook account. For more advanced page setup you can create custom tabs with tools like WooBox that link to your website or other social platforms. Affinity: This refers to the relationship that your fans have with your page. People that have friends that also like your page and those who engage with more of your posts will more likely see your content in their news feed. Weight: Images, videos, links and plain status updates all have a different weight and will perform differently. Content with strong visuals (photos and video) tend to perform higher than content without images and photos. Time Decay: The average lifespan of a post is about 48 hours, with the first 3 hours being the most crucial. It’s important to time your posts properly. That means that posting something at 11pm might not be the best time to get the most reach. Every Facebook page is slightly different so take the time to notice what works for your page and what doesn’t. Include a “Like” box on your website. Include social sharing buttons on your blog. Ask staff to add the Facebook Page to their personal profile as a workplace. Add “Visit Us on Facebook” to all print material. Run targeted Facebook Ads to increase reach. Post engaging content that people like, share and comment on. You can add competitors and other similar Facebook Pages to the “Pages to Watch” section to provide you a quick glance on how other accounts are doing. Experiment with different times of day and types of posts. Track the likes, comments, share and reactions for each post. Going into your insights to view your post engagement can sometimes give you more details compared to just viewing it on the home feed of your page. Use a content calendar to plan out themed posts (Motivation Monday/Throwback Thursday/Friday Funny). There are plenty of scheduling tools available but we suggest using the built in Facebook scheduling tool as it provides you with more content options and we find that your content tends to get better reach..
Keep posts brief: Create posts with 80 characters or less. Studies show that posts with 80 characters or less are more likely to get read and shared. Use short sentences—most online readers are skimmers, accommodate them. Longer posts: on occasion write longer posts to highlight information. These posts should be created sparingly to ensure engagement levels are kept up. Did you know? Post interesting, unique, fun factoids. When appropriate add a link, video or photo. Share behind the scenes photos at events and conferences. Share stats, studies, quotes from well-known experts, and new findings related to your organization. Create inspirational posts from industry leaders and organizations. Milestone posts: When you hit a milestone (500 fans, awards etc.) post a fun and engaging post and mark it as a milestone! Like and comment back to all comments and shares on your posts. Check your Facebook page regularly for new interactions. Follow other pages and like, comment and engage on their pages. Delete any spam comments or posts, but don’t delete negative comments, ask them to message you and take the conversation offline. Mix up your content and don’t be afraid to try new things. Update your Facebook page cover photo to highlight campaigns and attract attention. Post quality content rather than trying to post every day. Post images that are properly sized for Facebook. 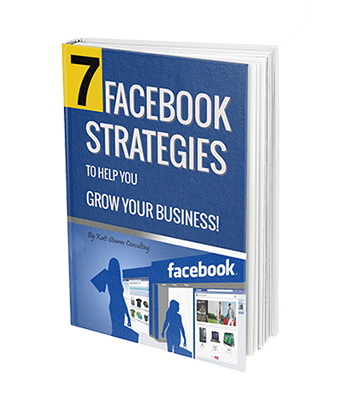 Facebook is constantly changing and adapting and can be a great way for you to grow your business. Features like Facebook Live, Facebook Ads and contests are strategies that you will want to master but before you do take some time to understand the basics of Facebook. For more specific strategies on Facebook check out our blog or visit or Facebook page.